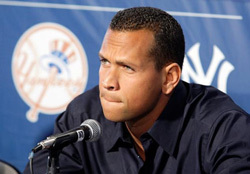 Alex Rodriguez was one of the most promising stars of Baseball in his early years. Starting with the Seattle Mariners, Rodriguez first got a taste of success with the West Coast team. Today, the star's luster has dimmed out considerably due to his frequent appearance in the tabloids and his antics off the field. Even when he is off the field due to his hip injury, the negativity has ensued and his name is taken in dismissal tones now. The recent reason for Rodriguez appearing at the back end of tabloids has been his involvement with another drug scandal. Rodriguez had previously accepted he had taken steroids while with Texas Rangers, and this time he has gone a step further by trying to destroy his links with the alleged anti-aging drug manufacturing company. His shadow isn't limited to the scandals: it is the downward spiral of a player who wanted to be the best and might have willingly taken the easier and faster path to success. But once upon a time, this superstar was the poster boy of baseball. He was the would-be legend who started shining with his home team and continued onto a national career that saw the young, spotless, eloquent, and handsome star inspire a whole generation of players. But since moving to New York, he has grown confused and harsh, in spite of having the same movie star looks and dating the actual pool of Hollywood glamour. He has been to the best places and rubbed shoulders with the uber rich and the best athletes in the world. And this is after he was believed to be the player who would remove the genre of overly muscular athletes who could get away with any misdeed because of their prowess on the field. Rodriguez still exudes an aura of confidence, but is unable to be a revered star like Joe DiMaggio who rose to greatness without even uttering a word. His downfall began with the 2005 inquiry against the steroid doping scandal that involved other great players like Mark McGwire and Sammy Sosa. Somewhere along the line, it stopped mattering what Rodriguez did: the drugs, the interviews, the shoutings, the slappings, the postseason failures, and so on. The 38-year old is now only a husk of his former self, and it will be interesting to see what route he takes for the remainder of his career. He has enough money to not play and still live off comfortably, or he could go to a minor league team. But the question is will the great star take this step? According to recent reports, Rodriguez may have turned down an offer from a Japanese club. He has done a lot of things both on the field and off it, which make it very easy to hate him. But the bottom line is he is a great player who has a number of records to his name and was once touted to be the greatest player of this generation.